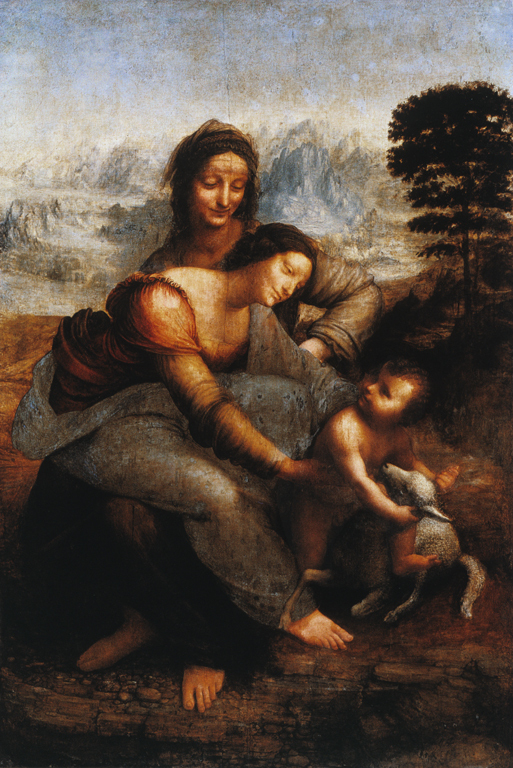 Although the St. John was at one time assumed to be the last of Leonardo’s surviving paintings, it now seems more likely that the Virgin and Child with St. Anne and a Lamb (Paris, Louvre) occupies this place. The forms of the draperies, rocks and landscape and the optical subtleties can best be aligned with his drawings and writings around 1515, when he was in Rome. The composition takes up the experiments of the lost cartoon of 1501; the integration of the three figures and the lamb is achieved by the shaping of their forms into a series of interlocking curves. The fluency of the motion disguises the physical improbability of the pyramidal group. 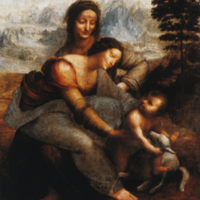 Leonardo da Vinci (Italian painter, 1452-1519), “Virgin and Child with Saint Anne,” Institute Images Online, accessed April 24, 2019, http://westerncivart.com/items/show/2923.